Imaging you’re in the Kalahari Desert. The first thing you see is this little creature, sitting on his hind legs, back straight, head held up high. At the first sight of you, he goes into a fit of barking, but after realizing you are not a threat, he stops. Five other heads then appear, out of various holes in the ground. What are these creatures? These are Meerkats. Meerkats are a form of Mongoose, and their name derives from the Dutch population of South Africa. There are three sub-species of meerkats. One, which is found in South Africa, and has the fur color of brown or orange. The second type of Meerkat is found in Angola, and the third is found in Nimbia, and has white fur, and is banded around the eyes. Unlike other Mongoose species, meerkats tails are not bushy, but are rather long and thin. The meerkat uses his tail for signaling, and for balance, and to stand up right. Their eyes are small, and crescent shaped, and always have black patches around them. At the end of their fingers is a 2 centimeter long, non-retractable curved claw that is used for digging. 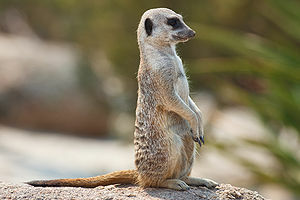 The meerkat has short, parallel stripes across its back from tail to shoulder. The markings on their back are unique and different to each individual meerkat. Their underside however has no markings, instead the belly has a patch that is rarely covered, which reveals their black skin. This patch is used to take in heat while standing on its hind legs, usually in the early morning, after a cold desert night. Meerkats can get up to about 12 inches long, not including the length of their tail, and weigh up to 1.61 lbs. Their average life expectancy can be as long as 12-14 years in captivity, and 6-7 years in the wild. In the African, Zimbabwean popular belief, meerkats are called “Sun Angels”, because they protect the villages from “Moon Devils”, or werewolves, which are believed to attack stray cattle, and lone tribesmen. Meerkats live in groups called “mobs”, “gangs”, or “clans”. Each Clan often contains 20 meerkat, but there are some super sized mobs containing 50 or more members. While the meerkats are foraging for food, one of them, called a “sentry”, stands on guard. The sentry’s duty usually lasts about an hour, as it keeps its eyes out for predators around the burrow. The sentry makes a peeping sound to let the others know that all is well, and she barks loudly, or whistles when she spots danger. During this time, the others will hide in the corners of their burrow, until the barking stops, signaling the others that it is then safe to emerge. Along with the sentry, there is also a baby sitter. This female, with no pups of her own, feeds the babies while their mother is away, and she protects them at all cost, even putting her own life in danger. When enemies are announced, she takes the young underground to safety, and prepares herself to defend them. If retreating underground is not possible, she will collect them all, and lie down on top of them. The female meerkat can have up to 4 litters a year, and each litter of meerkats can be anywhere from 1-5, with 3 being the average size. It’s most common though for the Alpha pair to have pups. The Alpha male will normally kill any young that is not his own, in order for his pups to have a better chance of survival. The dominant couple also may choose to evict, or kick out the mother of the offending offspring. This is how new gangs of meerkats are begun. The meerkat pups eyes don’t open until 10-14 days after birth, and their ears don’t open until day 15. Pups are allowed to finally emerge from their burrow home at 3 weeks of age, and as they do so the entire clan steps out to watch them. Baby meerkat don’t learn to forage for food until they are 1 month old. When they finally reach the correct age, they follow along with some of the older meerkats and observe them. By observing, they are taught not only how to dig for food, but also how to eat things, such as scorpions. Meerkats hold no excess body fat, and so daily foraging for food is a necessity. They are mainly insectivores, but they also eat lizards, snakes, spiders, eggs, small mammals, etc. They also are immune to certain types of venom, such as the strong venom of the scorpion, which is found in the Kalahari desert. Despite having disputes every once in a while, about pups, and rival clans, meerkats are very social creatures. They are known to engage in social activities, such as wresting and foot races. They’ve even been known to share their burrows with yellow mongoose, and ground squirrels.